Paris 1943, a city occupied by an invading army with a population struggling to survive by whatever means possible. Harry Mitchell is parachuted into this hostile landscape and tasked to find a German defector with valuable secrets. A traitor has compromised the Paris group and the eternal city becomes a battleground between competing Axis intelligence agencies, as much as between the resistance, and the occupying forces. Just surviving, let alone completing his mission may prove to be an impossible challenge. The war fought by the French resistance, aided by British SOE agents, has been fertile ground for thriller writers for decades. It takes no small amount of skill to find a new angle on such familiar material. 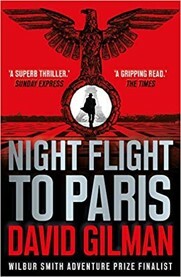 David Gilman has done so with an impressive display of style, producing a book that manages to be gripping from start to finish, whilst also having interesting things to say. He recognises that stories about life in occupied Europe during the war years can't be as black and white as a newsreel. Gilman's characters move in a world of moral compromises where individual lives are expendable, and betrayal is always a heartbeat away. Mitchell is a hero well suited to such an environment, an ordinary man forced into extreme situations by circumstances, rather than a square-jawed superman from a B-movie. The Gestapo and Abwehr officers hunting him are humans with believable frailties, not heavies from central casting, making their casual cruelty more shocking. This is a brilliantly achieved thriller that captures the frantic spirit of the time and the imagination of its readers.